It’s not that rare of an occurrence to pick up a newspaper and find a story about train or tube commuters forced to trek through a pitch-black underground tunnel due to a breakdown or signal failure. There’s the inevitable slew of quotes from shaken passengers describing how “terrifying” their ordeal was, as they sip a sugary cup of tea and vow never to return to the tube again. Imagine then how amplified those shaken commuters’ fears would be were they forced not only to live forever in those underground tunnels, but with the added danger of monstrous prowling beasts hunting them down. That, more or less, is the concept behind Metro 2033. Based on the novel of the same name by Dmitry Glukhovsky, you play the role of Artyom, a man whose entire adult life has been spent eking out a living in the metro tunnels of a near-future Moscow after an apocalyptic event has ravaged the world above. Each Metro station houses a community of survivors, each a warring, microcosmic amalgamation of pre-apocalypse political ideals. Were the opposing factions not at loggerheads, Artyom still would have to face the ever growing threat of the Dark Ones, beasts poisoned by the world above and whose psychic powers Artyom proves mysteriously immune too. It’s an interesting premise which developers 4A Games have obviously relished creating. The underground communities have not only been lovingly modelled, with impressive lighting effects and innumerable touches of lived-in flair, but also carry with them a genuine sense of melancholy. These are characters as broken as they are beaten, surviving on just scraps of food and their wits. You’ll feel real empathy for their plight, and the distinct atmosphere of each unique station makes a relatively far-fetched story grounded in very human emotion. Likewise the dark uninhabitable tunnels are truly forbidding, with excellent sound design making every step a cautious one. Many key design choices work to highlight the difficulties of Artyom’s survival struggles. For what is essentially a very linear and straight-forward shooter, there are enough clever design choices to qualify this as even a survival-horror title. First of all, there is no traditional HUD to speak of, and so using all of our hero’s life saving gadgets becomes a very tactile exercise. For instance your gas mask fogs up if overused in noxious areas and needs a constant supply of filters to work, and a pump action shotgun requires both controller triggers to work; one to pump and one to fire the thing. Also, with ammo scarce, every single corpse must be manually searched to uncover any supplies they may have been holding onto. While these touches certainly help to thoroughly involve the gamer in Metro 2033’s world, you cant help but at times feel that it’s all a little contrived. Struggling in the dark with a paper map and lighter is a neat touch, and the gas mask is ingenious in its visual execution, but the many mechanics the gamer has to fumble with can make the controls overly fiddly. The last thing I want to do when faced with a gang of blood-thirsty beasts is forget which button pulls out the hand crank to charge my head lamp. I’d imagine dedicated keyboard short-cuts would alleviate this problem somewhat for PC gamers, but it can at times be frustrating on consoles. Still, as perhaps unintentional ways of ramping up the tension, such features do feel at home in the nerve-racking, dilapidated metro system. 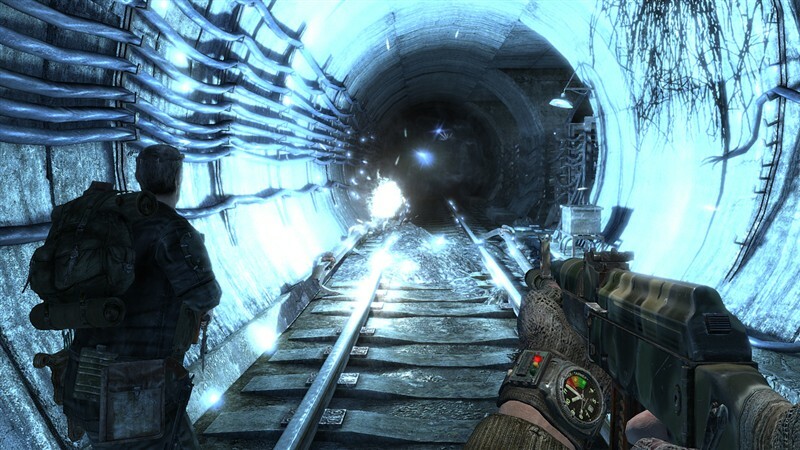 And though Metro 2033 admirably pays careful attention to atmosphere and detail, it feels lacking in perhaps the department where it needs to perform the most; its shooting mechanics. After enveloping yourself in Dmitry Glukhovsky’s rich literary world, the gunplay on offer can feel very weak. Even on the easiest difficulty setting you can unload round after round into a vicious Dark One or outpost guard, with no indication of how much damage you’ve inflicted. You can overlook this when battling some of the monsters (who am I to theorize as to how tough a fictional irradiated beast is?! ), but shooting a human square in the head with a shotgun and only knocking his helmet off obviously raises eyebrows. A little more effort in damage modelling would have gone a long way here. 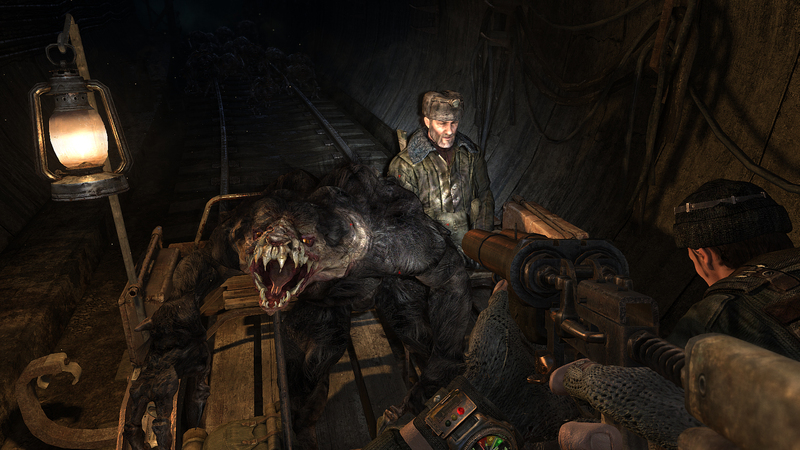 But for all its failings and foibles, there is something unique and endearing about Metro 2033 that pulls you back in. It’s a very bleak, and a times, difficult game to play, but that’s exactly what it is intended to be. This isn’t a balls out shooter in the Modern Warfare vein, but rather a unique vision of a potentially harrowing future. While it’s poor shooting means it never fully lives up its potential, the rich world surrounding the gunplay makes a venture into the dark tunnels as tempting as it is unsettling.